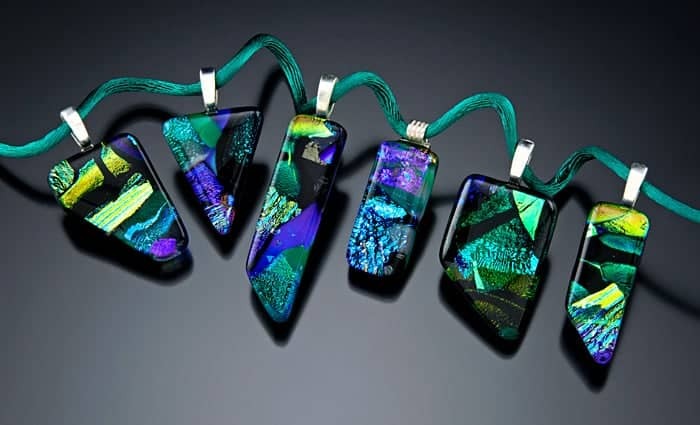 Dichroic Glass Jewelry is new to me, but has quickly become a personal favourite of mine. The beautiful colours, shapes and patterns make each piece one-of-a-kind and create a beautiful and bold statement. NGlassworks creates this unique style of jewelry and designer, Nancy Griere, does an amazing job!! Her work is phenomenal! Nancy describes a bit about the process on her site and it sounds very interesting. Different sizes and shapes of glass are stacked in unique designs and fired in a kiln. During the fusing process the glass comes alive and takes on a whole new character. After the first firing each piece is cold worked and fire polished in the kiln multiple times until I’m satisfied with the overall design and quality. Nancy sent me a Dichroic Glass Pendant for my review. I fell in love with it immediately. Everything about it appealed to me from the vivid shimmery colours to the intricate design of shapes. I loved that it was solid and sturdy and not at all flimsy or easily broken as you might first think about glass. Its super durable and I have worn my pendant out tonnes of times already and its been great! It comes with a black, satiny cord which is very comfortable and completes the look. 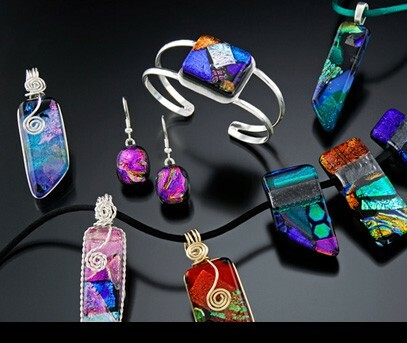 I would definitely go back to NGlassworks and buy more of Nancy’s designs both for myself and as gifts for my family. You can also find earrings, bracelets, rings, etc at NGlassworks. 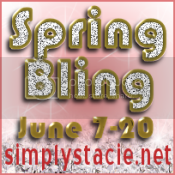 Check them out online and discover the beauty of Dichroic Glass!